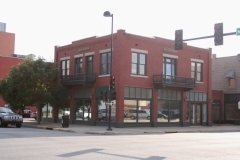 W. H. Gaiser moved his growing carriage business into this new two-story brick building along Wichita's Saint Francis Avenue in 1910, and he expanded it in 1920 to accommodate the shifting focus of his business to the automobile. Gaiser came to Wichita during the booming 1880s and partnered with J. M. Washburn in the Washburn & Gaiser Carriage Works. He took over the business following Washburn's death and specialized in custom work on any type of vehicle, first wagons and carriages and later automobiles. Having embraced the automobile as an important part of his business, he renamed it the W. H. Gaiser Automobile Works, which is still evident on a ghost sign above the storefronts. The business remained in the building until 1957. 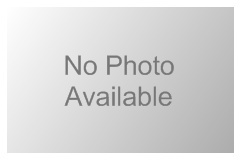 It was nominated for its local significance in the area of commerce. 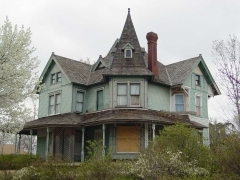 Located in the Park Place Historic District, the Gelbach House was nominated for its architecture and for its association with local businessman, George W. Gelbach. The home was built in 1910 in the Neoclassical style. Aside from a 1930 addition, the residence stands as it did when it was first constructed. The Gelbach House reflects the Neoclassical style's first wave of popularity (1900-1920) by its notable for its large Corinthian columns and full façade porch. In 1909, Gelbach moved to Wichita to form an insurance company with Robert L. Ogden. After only a year the company closed and Ogden became a city inspector while Gelbach opened a grocery store around the corner from his home. The successful venture lead Gelbach to become the proprietor of multiple successful grocery stores in Wichita. 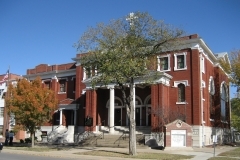 Constructed in 1910, Grace Methodist Episcopal Church, now known as Grace United Methodist Church, is a two-story, Classical Revival style religious structure designed by prominent and well-known architect, C. W. Terry. It is nominated for its architectural significance as well as contributing to its neighborhood character. Constructed in 1949-1950, the Grandview Terrace Apartments were nominated under Criterion A as a rare example of a post-World War II, private apartment building in the Fairmount neighborhood in north central Wichita. With the influx of WWII veterans and increase in job opportunities in aviation, the housing shortage in Wichita that began in 1940 and 1941 continued well into the 1950s. Local real-estate women Maud Beech (sister of Beech Aircraft founder) and Marguerite Mollohan took advantage of the unmet demand for modern living. The apartment complex included covered off-street parking as well as a beauty salon, pharmacy and restaurant. The property is also significant under Criterion C as a distinct 1950 Modern building and as a representative of established Wichita architects Overend & Boucher. The Grandview Terrace Apartments reflect the general tenants of the post-World War II Modern apartment building not unlike the federal housing during and after the war. 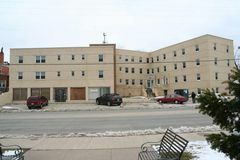 The apartment building was nominated under the Residential Resources of Wichita multiple property nomination as a rare Modern representative of the Conventional Low-Rise Apartment Building property type. Benjamin Guldner built this transitional Free Classic Queen Anne residence for his family in 1910 using architectural drawings produced by G. W. Ashby of the Radford Architectural Company of Chicago. The Radford Company produced catalogues and trade publications in the early twentieth century, and was significant in the shift away from popular Victorian-era residential architectural styles, such as Eastlake and Queen Anne, to more simplified Free Classic, Craftsman, and Classical Revival styles. This house exhibits that transition with its Queen Anne form and classical details. A primary feature of the Guldner House is its one-story wrap-around porch supported by Ionic fluted square pillars. 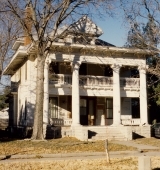 This property is the only documented Radford Company-designed residence in Kansas at this time. The property was nominated as part of the "Residential Resources of Wichita, 1870-1957" multiple property listing for its architecture. 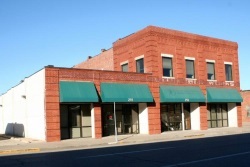 The Hayford Buildings are located in Greiffenstein's Original Town of Wichita on the southwest corner of Market and Second Streets. George and Eva Hayford purchase the property in 1900 and constructed the two buildings, called Hayford West and Hayford East, between 1903 and 1914. Hayford West, the older of the two b buildings, is a two-story rock-faced concrete structure connected to Hayford East, a two-story brick building. The buildings are connected by a one-story concrete block structure covered with a brick veneer. Although the two buildings were constructed at different times with different materials, there are similarities. Both structures have the same height and massing as well as similar fenestration. The Hayford Buildings were nominated for their architecture and how they offer a unique opportunity to view the progression of tastes in commercial architecture in the early 20th century. Willis T. Proudfoot designed Hillside Cottage as his personal residence in the late 1880s. Proudfoot and his business partner, George Bird, operated one of the leading architectural firms in Wichita from 1885 to 1890. Both men built their personal residences in the College Hill neighborhood. Hillside Cottage was Proudfoot's interpretation of a country cottage using elements of the Shingle style of architecture, such as the randomly laid stone walls and the intersecting gable roof clad in wood shingles. In 1890, Proudfoot and Bird moved to Salt Lake City, Utah. This residence then became the first clubhouse for the Wichita Country Club golf course. 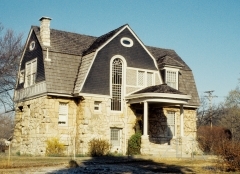 Hillside cottage was nominated for its unique architecture and for its association with Willis T. Proudfoot and the Wichita Country Club. 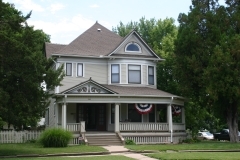 Holyoke Cottage is a wood-frame, two-and-one-half story, Queen Anne-style residence constructed in 1888 for Reverend J. H. Parker, a Congregational Church minister who helped found Fairmount Ladies College (now Wichita State University). The building is nominated for its association with Reverend Parker and as an excellent example of the Free Classic subtype of the Queen Anne style of architecture. The Hypatia House was built for G.T. Walker, manager of the L.C. Johnson Coal Company, between 1903 and 1906. It was designed by Wichita architect, Ulysses Grant Charles, who designed over 100 residences and 40 commercial blocks in Kansas. The Hypatia House is a two-and-one-half-story buff brick Dutch Colonial Revival home with a cross gambrel roof and limestone foundation. The residence also exhibits some features of the Shingle and Prairie style. The Hypatia Club purchased the residence in 1934 and turned it into the first official Hypatia clubhouse. 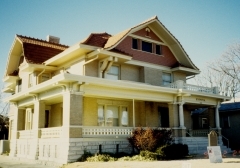 The Hypatia Club, founded in 1886 by Mary Elizabeth Lease, was the first women's club in Wichita. The club focused on education, culture, and women's suffrage. The Hypatia House was nominated as an example of Dutch Colonial architecture.